Small and large diameter boreholes/wells, variety of sampling methods, well development, IDW management, medically monitored and OSHA trained. Well Fields in excess of 500 loops, depths up to 500 feet. Projects include road construction, commercial sites, bridges, dam repair, and sink hole studies. East Tennessee and Kentucky regions with well fields of 30 plus wells, up to 6000 ft depths. Municipal water wells, vent shafts for the coal industry, irrigation wells and de-watering wells. 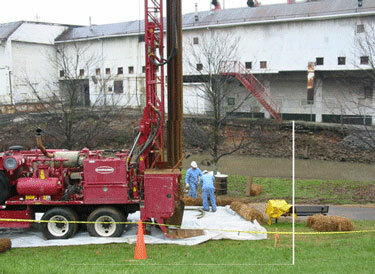 In-situ grouting, foundation drilling, micro-piles, slope stabilization, and earth dam modification.